I recently tried Street Photography with a Medium Format Camera, now it was time to have a go with a Leica, yep I finally have a Leica! More years ago then I care to remember, I fell in love with a lovely little range finder in a shop window. I saved and saved and finally managed to buy it. It was not a Leica but it was a very nice looking camera with good optics. Unfortunately it had not been looked after and it just would not work properly, the film advance kept jamming. The shop took it back, but I did buy a rather nice looking Zeiss Ikon Ikophot Light Meter which I still have to this day. Since then I have been on the lookout for a Range Finder. There were two makes I would like to own, either a Nikon SP or a Leica M. Nikon SP’s are very hard to get hold off, and while I am a Nikon man, with Nikon SLR’s and 35mm lens to match and Nikkor Large Format Lens to go with my Large Format Ebony 45s; the Leica with its fantastic glass was the one I wanted. With digital getting more and more popular; the Leica M became a bit of a niche product, and their lens, while new very expensive, second hand were more affordable. With the release of the Leica M8 I started to think more and more about a digital Leica, and while it had its issues, the M8.2 was a great camera for Black & White with its extended infra-red sensitivity. So a digital M was on my list, but cost was going to be an issue, and would I get on with a Range Finder. The best thing would be to get an old cheap film M and learn with that. 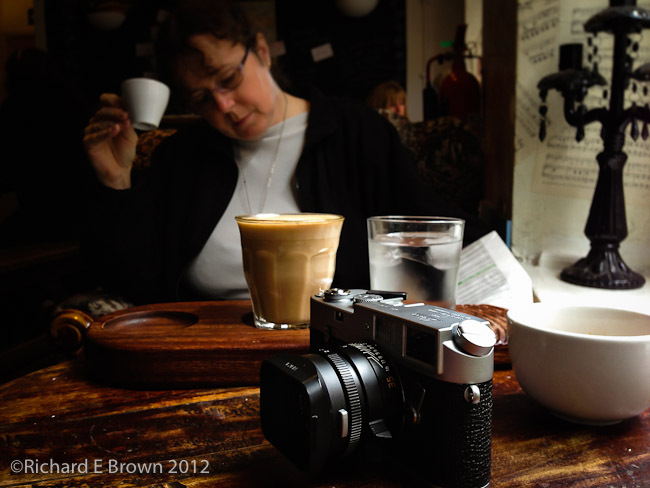 So to that end, over the last few years I have started to buy Leica M lens. So far I have only managed to get two at a good price, but with the release of the M9 and the increasing interest in the brand, its turned out to be a good investment, so if a Range Finder is not my cup of tea, I can sell the lens at a rather nice profit. So the choice was a film Leica, but which one. Well it would either have to be the ultimate film M, the Leica M-P, or a classic. Well an M-P retails at the sort of cost I could buy a Digital M8.2 for, so a classic would be the cheaper option, but which one? To be honest there was only two choices, the original M, the Leica M3 or to get the model that was available the year I was born. The original M3’s are either very much collectors items and have a corresponding cost, or of very poor quality. The Leica that was manufactured the year I was born was the Leica M4, while not as many M4’s were made as M3’s and the later models still fetch a very high price, the ones from the year I was born are very affordable. So for the last two years I have been searching the internet for a good copy of a M4, made in the year I was born. When it arrived I was very surprised at the condition, its very nearly mint, and looks like its been really well looked after. 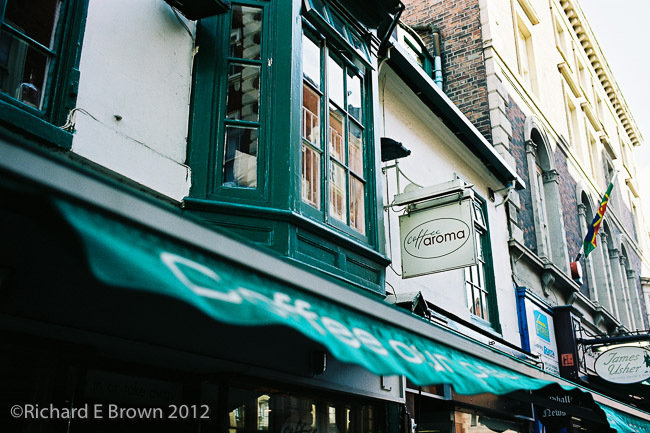 I popped in an old out of date cheap roll of Fujicolor Superia (I wish people would spell colour correctly), and went out to give it a try. 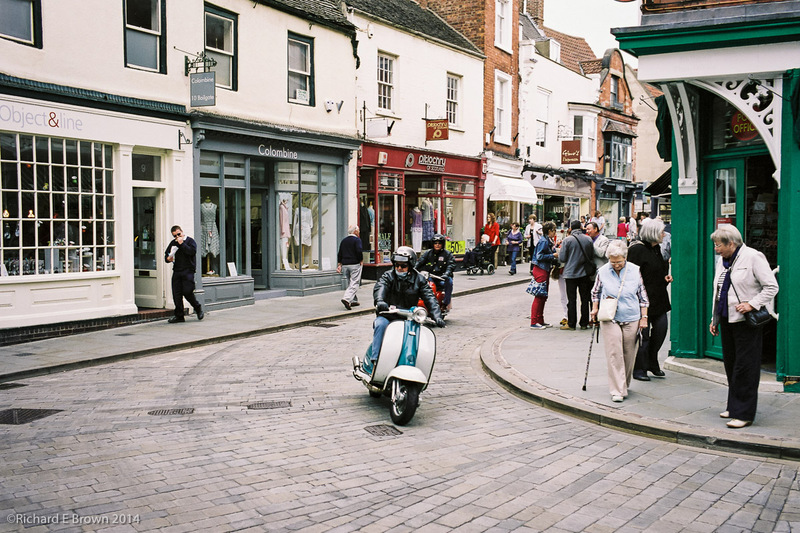 The M4 like the Leica M3 has no meter, thats becoming a bit of a theme with me. Of all my film cameras, only my Nikon FM2n has a meter, my Leica, my Hasselblad and my Ebony all lack meters. So I also took with me my spare studio meter, and my classic Zeiss Ikon Ikophot, I would use my modern meter but compare the readings with my classic to see if it was consistent. We went for a walk into Lincoln and I shot a few few frames of what every took my fancy. With the low sun, depending on what direction I was shooting I was getting a stop difference in the light, so I had to keep remembering to change the shutter speed or aperture depending on what direction I was shooting, focusing was another challenge. The technique I used was to make a guess at the distance, and set that on the lens, then I would bring the camera to my eye and make a final adjustment. Most people have seen the photographs that Leica’s are famous for, a sharp focus and lovely out of focus background. Well possibly not the best subject but when I spotted the ribbon tied to the gate I thought I would give it ago and try a wide open shot. 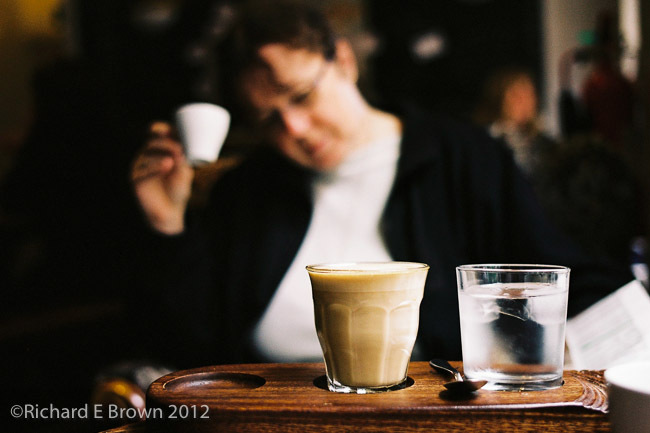 At lunch time we had a walk to one of our favourite coffee shops. 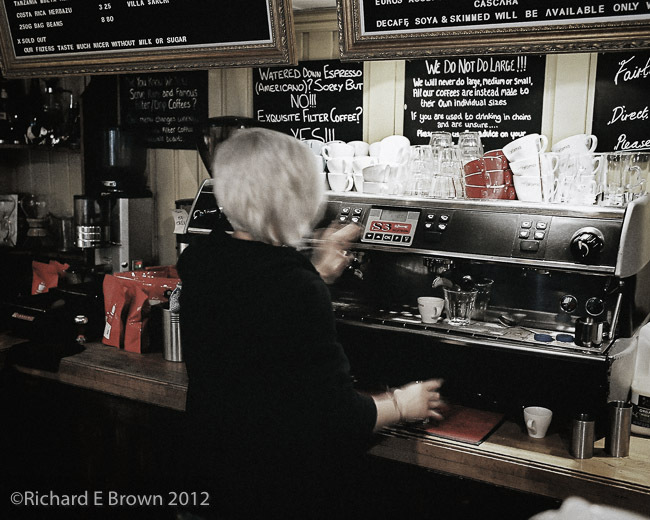 They say Leica M’s are very good in low light, this was a chance to try it out. In all, I shot eight frames that first day, and fully enjoyed my time. Like my Medium Format Hasselblad and Large Format Ebony, its a very involving experience and there is a lot to think about. Its a lot faster and easier to shoot with then the latter two cameras and a different experience but very full filling. One has to keep ones wits about you, with it being 100% manual and no meter, catching moments like this can be tricky, but while underexposed its still a pleasing image. If I carry on enjoying the experience, then i’ll be on the lookout for a Leica 90mm M lens and a 50mm standard to tryout in the studio. I’ll also be looking out for a second hand M9. With the release of the M-E the old M9’s have dropped considerably in price, and I hope this drop will continue when the new Leica M (240 model) is released. Overall I am very impressed with the results; for an out of date roll of old film, and a basic scan, the results are very pleasing. Next i’ll try a little landscape and also some sport. They said you could not use medium format for street photography; and they say a Leica M is useless for sports and wildlife, might try and disprove that.